This week's entry for Ben Towle's Animal Alphabet is the Lacewing. 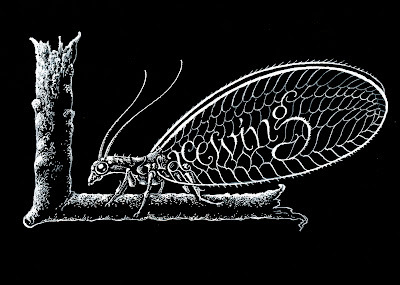 White gouache (applied with a flexible crow-quill) on black charcoal paper, with a PS tweak or 2. Edit: Ben asked me about the pen & gouache technique so I thought I'd add a few tips. First, mix a small quantity of gouache to a light-creamy consistency (I use a clean empty ink bottle since I always have those handy), then apply the gouache to the underside of the nib with an old brush (it's bad for the brush so don't use your good ones). Keep a water jar handy for when the gouache starts to dry on the nib-- just touch the nib to the surface of the water & it will make it flow again. Keep scrap paper handy to get the flow started when it's stubborn, & be sure to shake the nib after each load of paint or you may be unhappily surprised with a sudden blob. If you have any more questions just let me know! That's AWESOME. It blows my neuropteran entry (letter D) out of the water. I really like what you did with the text. If it'd been me, I'd have just drawn it in black ink on white paper, then reversed the color values in Photoshop. But I'm lazy. BEAUTIFUL! What else I should say? Looks great! I love your style. Wow! I have never used gouache before. It sounds like a challenge. This is beautiful. Thanks, everyone! Yes, it's true that gouache can be a bit fussy, but I love it-- it makes such a nice, crisp line when the magic works! And of course you can mix up any color, even load multiple colors for an ombre effect. Give it a try! Beautiful piece of work. And, thanks for the technical tips.